The first of the Arctic and Offshore Patrol Vessels (AOPV)1 being built by Irving Shipbuilding under the Arctic and Offshore Patrol Ship (AOPS) project for the Royal Canadian Navy (RCN) was launched 15 September 2018. A naming ceremony will take place 5 October 2018. The following are short descriptions of some of the terms that could be used during such occasions. Naming. Though traditionally naming and launch ceremonies were filled with religious aspects, increasingly they have become secularized. In the RCN the ceremony was called a christening but in modern times that has been changed to naming. At the ceremony, after speeches and prayers2, the sponsor breaks a bottle of wine3 or other liquid on the ship’s bow as a toast and then declares the ship’s name4 with words as “I name you Harry DeWolf. Bénit soit ce navire ainsi que tous les hommes et femmes naviguant à son bord.”5 It is at this point that the ship is officially named. Prior announcements are declarations of the intended name, and ships have on occasion had their name changed before their naming ceremony. During building the ship may be called ‘Irving Hull ###’ by the shipbuilder or ‘AOPS#’ by project staff; she can also be known as ‘future HMCS Name’ or ‘future Name.’ The future HMCS Harry DeWolf 6 is Irving Hull 103 and AOPS1, and her sisters of the Harry DeWolf-class will be numbered sequentially after that. Sponsor. A person, traditionally a woman, selected for her or his relationship to the ship’s namesake or role and who represents the crown/state at the naming ceremony. It is said that the sponsor’s spirit and presence guides the ship throughout the service life of the ship. Launch. A launch usually occurs after a naming but as the launch process for an AOPS can take a couple days and as it is intended that the naming be a major ceremony, the launch for Irving Hull 103 was prior to the naming. In the past, right after the sponsor declared the ship’s name, a ship was launched stern first, bow first or sideways (beamwise) down a slipway directly into the water. In the case with Irving Hull 103, the vessel was ‘transitioned,’ carried from the wharf where she was built onto a barge. The barge was moved away from the wharf and semi-submerged, allowing the ship to float up. The ship was then towed to the wharf and secured alongside to be fitted out and for the naming ceremony. Acceptance. 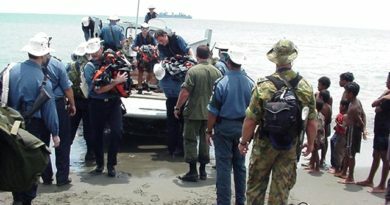 The occasion of signing a certificate by AOPS and other government staff and by shipbuilder representatives indicating that the builder has achieved contract requirements to date and that the government now assumes responsibility for the ship. The occasion is marked by a small ceremony, usually in the ship’s captain’s cabin. For Harry DeWolf, acceptance will occur some time after the launch, after builder’s and acceptance trials are completed and before naval trials and the commissioning ceremony. Acceptance can be considered as ‘delivery’ of the ship by the builder, though that may be affected by contractual stipulations. After the acceptance a naval officer assumes command of the ship (having been ordered or commissioned to do so), relieving the shipbuilder’s civilian master. The ship is legally in active service as of this time, and the identifier HMCS (Her Majesty’s Canadian Ship) is put as part of the ship’s name. Builder’s Trials7. Evaluation trials and inspection conducted by the builder for the purpose of assuring the builder and the Navy that the ship is, or will be, ready for acceptance trials. These trials are a comprehensive test of all ship’s equipment and approximate the scope of the acceptance trials. Commissioning. The ceremony marking the taking into active naval service of a ship. The event may be some months after the date when a naval officer took command and the ship entered active service. Commission refers to the orders to a naval officer to take command; it is not the ship per se that is commissioned though often the expression “commissioned ship” is used. AOPV is the ship type designated by the RCN for operational purposes (e.g., in computerized information systems). See “Warships, Combatants, Types and Classes” https://rusi-ns.ca/warships-combatants-types-classes/. 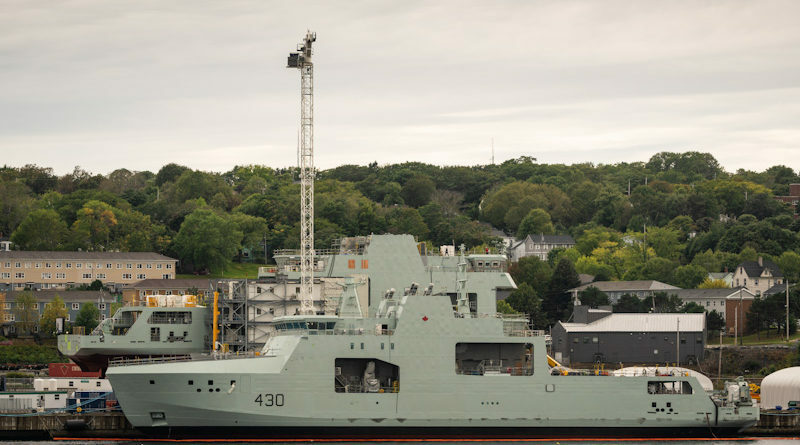 As is increasingly the practice during naval and other Canadian Armed Forces ceremonies, the naming of Harry DeWolf will include a smudging ceremony performed by an elder of the Mi’kmaq. It is understood that a bottle of Nova Scotia sparkling wine will be used for Harry DeWolf. 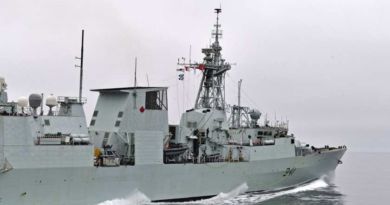 “Naming and Renaming Canadian Warships” https://rusi-ns.ca/naming-renaming-canadian-warships//. For a comprehensive source, see David J Freeman, Canadian Warship Names, Vanwell Publishing, 2000.